Objective: For the centre back to resist the attackers progress to the hole, to take up a good position and to work to stop the centre forward scoring; for the centre forward to work into position and get the shot away; good quality passes into the centre forward; for the goalkeeper to cooperate with the centre back positionally. Description: The team queue up on half way, apart from the centre back and goalkeeper who take up their defensive positions. One by one, each play swims in towards the hole. 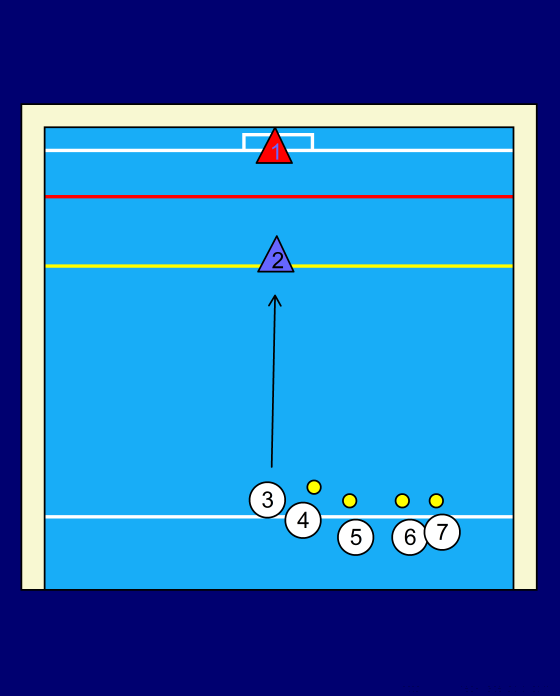 The centre back picks up the centre forward at 6 meters and the forward needs to push back to 2.5 metres from goal. 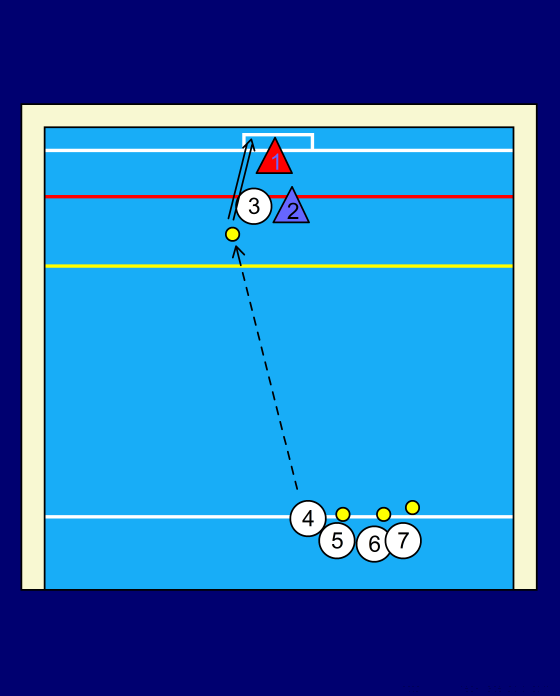 The ball is thrown into the centre forward from the middle of the pool (only one example of possible centre forward/back positions is illustrated). The forward tries to get the shoot away, while the defender attempts to stop this. The centre back defends against each team member going in as centre forward, before changing with another team member. Variations are to use centre backs only for passing and defending the hole, and centre forwards only for shooting; or to have players drive after the pass has gone in, so the centre forward can shoot or pass. Coaching points: The defender needs to resist the attacker getting set, initially forcing him to one side or another, and then attempt to get round him.